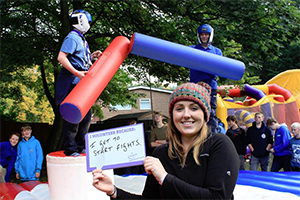 Can you spare some time to help us at Durham Scout's biggest weekend of the year? As part of our 60-strong volunteer team that runs Confido, you'll create a brilliant atmosphere, provide some fantastic activities and help with those essential behind the scene jobs that make Confido such a success! You'll need to be over 18 to join us and we promise you'll have a great time helping us provide fun, challenge and adventure to over 1000 young people. With live music, our own radio station and over 50 activities, its a festival atmosphere to remember. Activities - activity instructors across all our 50 activities. Some need specific qualifications, some just energy and enthusiasm! Help Desk & Security - helping deal with questions around the clock. First Aid - 24 hour First Aid for those who are unfortunate enough to need it. Site Services - looking after the water, toilets and campsite. Technical - building and looking after our Power, Sound and Lighting. Media - press, social media and newspaper. Catering - keeping everyone fed and watered at Confido cafe. Stage Team - evening entertainment and Confido Radio! We ask for a donation of £25 to join our Staff Team, which covers food for the weekend, indoor accomodation, exclusive Confido T-Shirt and badge. And don't forget, if you can spare more time, you can think about joining our Build Team that creates and takes down the magic! Bookings for the Staff Team are now open.